However, before too long, the protagonist finds that he is searching for something more than just a lost cricket ball, as it evolves from ‘that small, seamed planet’ into a ‘world restored’ and he emerges from the bushes like ‘some astronaut, or lost explorer’. Moreover, it soon becomes clear that Kunial’s search for meaning arises from his mixed race heritage. Born in Birmingham of an English mother and a father who comes from Kashmir, it is no coincidence that the context of Kunial’s opening poem is a game invented by the English but which has been so passionately adopted throughout the Indian subcontinent. In ‘Self Portrait as Bottom’ the poet’s desire to explore his family roots involves him taking a DNA test. He discovers that, genetically at least, he is ‘50% Europe, 50% Asia’. However, this simplistic paradigm breaks down into further fractions. On his mother’s side he is 17% Ireland; 3% Scandinavia’. Even his father has inherited ‘2% West Asia, or Caucasus’. It is clear, however, throughout this collection that one’s identity cannot be reduced to a formula and that one’s sense of belonging arises from a complex web of history, culture and language. This mountain speech is a low language. Ours. ‘No good. Frequently, one’s sense of identity boils down to a question of allegiances. The point of departure for ‘Spider Trees, Pakistan’ is a quote from William Dalrymple’s The Last Mughal. Contemplating the lives of the British and the Mughals in the days of the Raj, the poet finds it impossible to bridge the gap between ‘Worlds I can’t marry’. In another poem, ‘You’, one feels that history is merely a concocted narrative in which the interpretation of events depends upon which side you are on. An outbreak of violence may be called a ‘Mutiny’ or a ‘Rebellion’. It is ‘Words and words / only’, concludes the poet. Even a simple pronoun can be a source of unease. In one of the most powerful moments in the entire collection, the poet’s father laments the fact that he ‘can’t make good fist / of speech like you. Because of you’. The poet is forced to ask himself whether this pronoun is plural and directed against the British or singular perhaps and directed against his mother. Even when his father has returned to his native village in Kashmir, there is no escape from the claims of history. In ‘Jute’, a small group of Pashto-speaking Afghans are passing through, but lay claim to his father’s house. At least on this occasion, his visiting son’s allegiance is unequivocal: ‘But it’s not Dad. / It’s yours’. In ‘I’, the poet traces a link between his own first name and that of Zafar, the last Mughal emperor, deposed by the British and also a poet. Here, as in so many of Kunial’s poems, he forges cross-cultural links, when the plight of the unfortunate Zafar reminds him of Shakespeare’s Richard II. In ‘Prayer’, the Islamic Takbir Alla hu Akbar rubs shoulders with a quote from the Anglican poet George Herbert. from … To turn one’s face. The p and the t.
In the end, however, the poet seems unable to locate his ideal community, his true homeland: ‘When it comes to us, colour me unsure’, he says, though still aspiring towards it and determined to continue his quest. 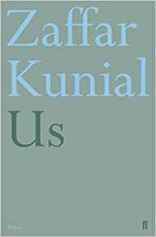 Intelligent, authentic and, above all, humane, Zaffar Kunial’s Us is a memorable and poignant debut. Convincingly rooted in personal experience, it nonetheless touches upon issues of wide-ranging significance.